ROME - The World Jewish Congress has urged the Israeli government and the Palestinian Authority to return to direct peace negotiations without preconditions as soon as possible. Jewish leaders from several dozen countries also called on the international community to maintain, and if necessary expand, sanctions against Iran pending verification of compliance with the nuclear agreement reached with the p5+1 group of nations. Both resolutions were adopted by the WJC’s Governing Board during its annual meeting this week in Rome, attended by leaders of the WJC’s 100 member communities and organizations. The Governing Board reaffirmed that the principle of “two-states for two peoples is the only workable, realistic basis for a true and lasting peace” and reiterated that “a peace agreement can only be reached in bilateral negotiations and not imposed by any outside party.” It also condemned the recent wave of terrorist attacks against Israeli citizens and urged the Palestinian Authority, in particular Mahmoud Abbas, to refrain from using inflammatory rhetoric against Israel and treating terrorists as heroes. The resolution calls on the international community, particularly Arab states, to intercede with the Palestinian leadership to ensure the cessation of violence. 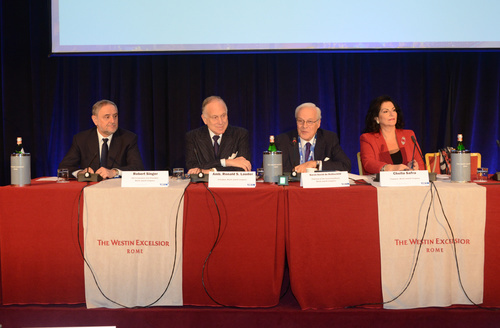 CaptionFrom left: World Jewish Congress CEO Robert Singer, President Ronald Lauder, Governing Board Chairman David de Rothschild and WJC Treasurer Chella Safra at the annual Governing Board meeting in Rome on October 27, 2015. In a resolution on Iran, the board voiced skepticism that the nuclear deal reached in July 2015 would achieve its objective of preventing Iran from developing nuclear weapons and removing the threat of a nuclear-armed Iran through diplomatic means. Nevertheless, it voiced concern that Tehran would honor the terms of the agreement and pointed at “troubling and difficult” gaps in the deal, and expressed the need for constant examination and vigilance. The Jewish leaders also urged the international community to “demand from Iran an immediate stop of any financial and logistical support to terrorist organizations,” and called on the Iranian authorities to comply with Argentinian requests to hand over citizens suspected of involvement in the 1994 bombing of the Argentine Israelite Mutual Association in Buenos Aires, which killed 85 people, and the 1992 bombing attack against Israel’s embassy in Buenos Aires, which killed 29. Nearly 150 delegates and guests were in Rome this week for discussions on the situation of Jews around the world. On Wednesday, they will be at the Vatican for an audience with Pope Francis on the 50th anniversary of the landmark declaration Nostra Aetate, which was promulgated on October 28, 1965. On Wednesday, WJC President Ronald Lauder will hold a press conference at 3 p.m. at the Stampa Estera Association in Rome, Via dell’Umiltà, to brief reporters about the outcome of the board meeting and his audience with Pope Francis.